The first (light station) lighthouse was built here in 1823. The one shown here was built in 1849 by Cyrun Alger & Co. You can see the brick fuel house in the right hand side of the picture which was built in 1894. 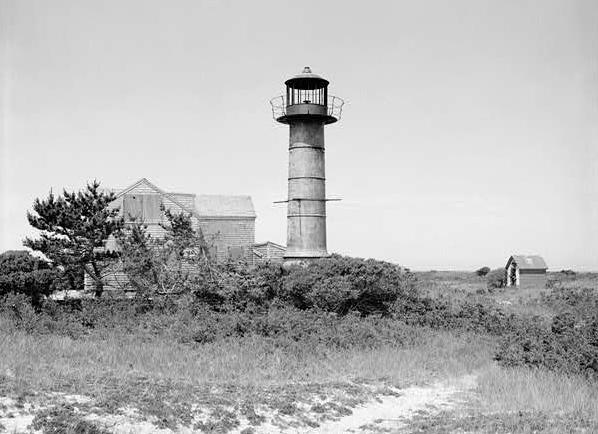 Originally built in response to Federal period growth in coastal traffic, the Monomoy Point Light Station is an early example of a cast-iron fixed coastal light. This photo was taken in 1987. The Monomoy light station was restored in 1988 and is now used by the Cape Cod Museum of Natural History as an educational center. This image has been viewed 7989 times and no comments have been submitted yet. You may leave a comment about this image. You can also view more General and Cape Cod images or learn more about Cape Cod.